Acer is producing a Chromebook that is designed specifically for business -- and the truly clumsy. The new laptop, Chromebook 14 for Work, is due in May at a starting price of $349. As its name suggests, it may be aimed at a specific group of users: Businesses that have adopted Google for Work or live mostly in the cloud. But it also has some interesting design features. Say you're sitting in an airport lounge and accidentally spill your coffee on it. The coffee saturates the keyboard. The hot coffee causes you to jump up, sending the laptop to the floor, which lands with a jarring thud. You accidentally step on your laptop and slip, sending the laptop across the floor until it hits something. Other passengers in the airport lounge are now really staring at you. Embarrassed, you pick up the laptop and, to the likely surprise of your fellow travelers, continue working on it. The new system, Chromebook 14 for Work, offers full HD, up to 10 hours of battery life, a backlit keyboard, a sixth-generation Intel Core processor, USB 3.0 Type-C port, either 16GB or 32GB eMMC storage and 2GB to 8GB of RAM. And the '14' in the name refers to a 14-inch display. Acer says the keyboard is spill-resistant (it includes drain gutters) that can protect against 11 fluid ounces. Acer says it can further withstand up to 132 pounds of downward force, and drops of up to 48 inches. Acer says this meets a military specification and, while it's unlikely to replace the thick, bulky, hardened and expensive laptops used by the military in the field -- such as Dell's Latitude Rugged Extreme or the Panasonic Toughbook -- it should survive a lot of common accidents. The Chromebook uses a customizable Gorilla Glass cover that will allow business users, with an undisclosed minimum order, to display a corporate logo in vivid realism. The image is printed on the glass. The overall direction for Chromebooks is clear. "Chromebooks are a legitimate enterprise employee device option, at least for some companies and some use cases," said Forrester analyst J.P. Gownder. "Chromebooks offer a great security paradigm, are easy to manage, can be easily shared between users, and have a low total cost of ownership," he said. "IT people generally spend large chunks of their summers imaging Windows PCs, which goes away with Chromebooks," he said. Imaging is a means of restoring a PC to its original state, as well as delivering the same suite of apps to multiple users. But Microsoft's Windows Anniversary Update will include tools to help make this easier and allow managers to image PCs in bulk, he said. "All in all, Chromebooks are useful for some enterprises in some use cases, but many enterprise-critical apps aren't cloud-based, and Windows PCs aren't going anywhere," said Gownder. "But OEMs see an opportunity to include Chromebooks as part of their enterprise offerings, as some sub-segments of the user base can move to Chromebooks." Charles King of Pund-IT said several key issues are driving development of business-class Chromebooks. First and foremost, he said, is that the concept of working in the cloud is mainstream. Google "has been particularly effective in maintaining the stability and availability of its cloud platform, meaning that it is fully regarded as a business-class service," said King. Another factor was brought home last October, when Microsoft announced the availability of an extension that allows Office 365 to run on Chromebooks, "meaning that users and organizations wouldn't have to contemplate painful migrations to Google Docs or Drive," he said. Dell also has a line of Chromebooks aimed at the business market that include a carbon fiber chassis. 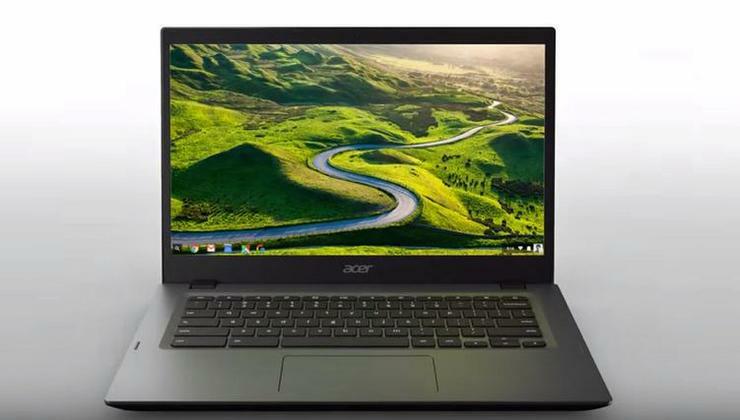 "The fact that Acer is taking a similar road to Dell's likely indicates that Chromebooks are migrating into the workplace at a steady, possibly accelerating rate," said King.